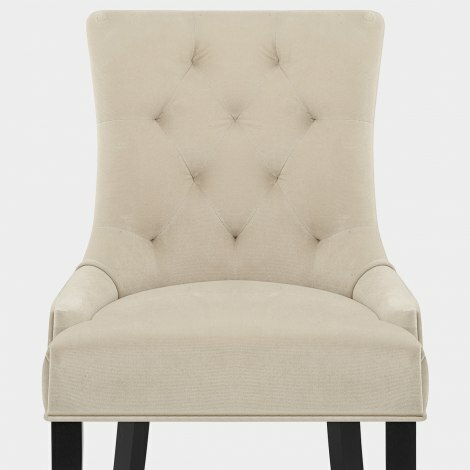 Give your dining area an exclusive upgrade with the Newbury Dining Chair Cream Velvet, a truly delightful item. The Newbury is a classic piece with contemporary charm, set to bring a sophisticated feel to your dining area. An accommodating design densely padded for comfort, the sprung and belted seat displays luxurious cream velvet upholstery. Further to this, a tall backrest provides excellent support, subtly curving around the seat for added reassurance, whilst quilted detail makes a stylish feature. Below the seat, four solid wooden legs form a strong base and display a black satin painted finish that lends a sleek contemporary look. Aiding in the protection of your floor surfaces, the legs include discreet rubber plugs on the underside. "The website to delivery was faultless"
When I originally placed the order on 26th September, the chair was out of stock with a due in to stock date of 10th October and next day delivery of 11th October which was not a problem. I was most impressed when I eventually received an email confirming a delivery date of 11th October which I duly received on that day. The chair was for my mother and makes a perfect bedroom / dressing table chair. Great service, thank you. Excellent service and free delivery. Not many suppliers do that. The chair is in our bedroom and it is beautiful. Everything from browsing the website to delivery was faultless!